Tawanda Chandiwana, center, has been detained in the Philippines since May 9. United Methodist officials are making a public appeal to the Philippines government to release Chandiwana, who has denied any wrongdoing. Officials have asked that he and two other missionaries be allowed to leave the country. Photo courtesy of the United Methodist Board of Global Ministries. United Methodist officials are making a public appeal to the Philippines government to release a detained missionary and allow him and two other missionaries based in Davao City, Mindanao, to leave the country. Tawanda Chandiwana has been held since May 9, when he was arrested while attending a training seminar at the Mindanao Peacebuilding Institute. The charge was related to delayed paperwork regarding his expiring visa, but he later was found to be on a “watch list” of suspected subversives. Chandiwana has denied any wrongdoing. He and the other United Methodist missionaries — Miracle Osman and Adam Shaw — were detained at police checkpoints in February while taking part in an international ecumenical fact-finding investigation of alleged human rights violations, including the deaths of nine indigenous people. Miracle Osman, center front, has been unable to leave the Philippines voluntarily after her passport was confiscated as she was extending a tourist visa while waiting for her missionary visa. Photo courtesy of the United Methodist Board of Global Ministries. The United Methodist Board of Global Ministries has been working for weeks with Filipino United Methodist bishops and others to secure Chandiwana’s release. He was moved from Davao City to Manila on June 4 and currently is in the Bicutan Detention Center. Now, the mission agency and the United Methodist Council of Bishops are mounting a public campaign on behalf of the church workers. Global Ministries also has created a petition on Change.org for people to sign and the World Council of Churches has joined the appeal. Osman’s passport was confiscated as she was extending a tourist visa while waiting for her missionary visa to be approved, making it impossible for her to leave the country voluntarily. Shaw has been informed that an order to leave is imminent but it has not been served, Global Ministries reported. Both Chandiwana and Osman are part of the Global Mission Fellows program of Global Ministries, which places young adults ages 20-30 in new contexts for mission experience and service. Adam Shaw has been informed that an order to leave the Philippines is imminent but it has not been served. Photo courtesy of the United Methodist Board of Global Ministries. Chandiwana, 28, from Zimbabwe, is a lifelong United Methodist who says he was saved by God and wants to serve God by serving others. A member of Hilltop United Methodist Church in Mutare, he has a master’s degree in public policy and governance from Africa University, the United Methodist institution there. Osman, 24, from Blantyre, Malawi, believes missionary work is God’s perfect plan for her life, her bio says. She holds a social work degree from the Catholic University of Malawi and has been the young women’s coordinator for The United Methodist Church in Malawi. Shaw, 29, of Brunswick, Ohio, is the son of the Rev. Thomas and Susan Shaw, who were missionaries in Tunisia and Germany from 1994 through 2003. He has been a Global Ministries’ missionary in Mindanao since 2016 with Save Our Schools, an education network for indigenous children, and previously served in the region as a mission intern. Shaw says his vision of mission work includes a commitment to genuine peace based on justice. Sign the Change.org petition to the government of the Philippines. Use a social media toolkit to support the release of the missionaries. 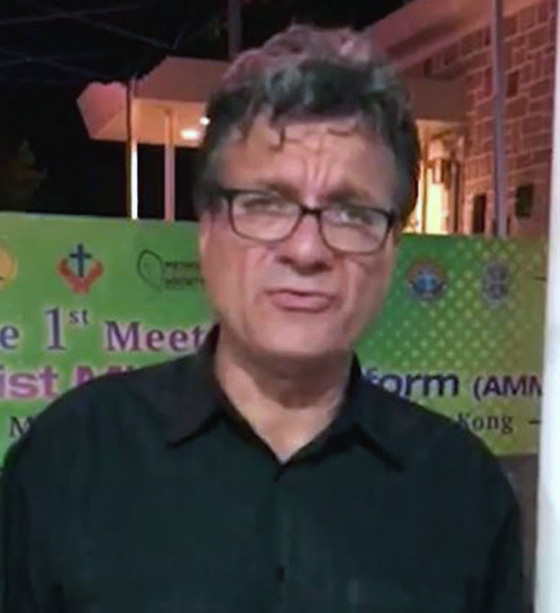 Watch as Thomas Kemper, on behalf of the United Methodist Board of Global Ministries, calls upon the Philippines government to allow three missionaries to leave the country and suggests actions for support. The three missionaries were assigned to InPeace (the full name is Initiatives for Peace), a grassroots, interfaith movement that describes itself as supporting sustained peace negotiations among those involved in armed conflict with the view of achieving meaningful reforms from these talks to benefit the peoples of Mindanao. Global Ministries has had a “long, long relationship of trust and mission collaboration with InPeace and has placed young adults there since 2006,” Kemper said. Becky Asedillo, a Filipino native and longtime Global Ministries staff member, visited Chandiwana at the detention center in Davao City three times in late May. “He was hoping for early release,” she said. Global Ministries engaged the Rev. David Pascua, a United Methodist missionary and professor at Union Theological Seminary, to provide pastoral care for the three, Asedillo said. Pascua organized a group to meet Chandiwana when he arrived at the Bicutan Detention Center in Manila. Visitors to the missionary have included delegations from the seminary and from the National Council of Churches in the Philippines. Kemper said he hopes to see Chandiwana on June 30 before a previously scheduled meeting in Manila and plans to make a detour to Mindanao early next week to visit InPeace in a show of support.